New data from Forrester confirms that LinkedIn is the most-used social network for work among ‘decision-makers’. Using data collected from 283 of these business leaders at North American or European companies with over 100 employees, they were able to determine that LinkedIn was used by 81% of respondents; 48% used LinkedIn for both business and personal purposes, while 26% used it for business primarily, according to a post by Zachary Reiss-Davis. The wide use of LinkedIn for business illustrates the broad acceptance of the social network’s contribution to business success. Be it recruiting, networking, marketing or anything else, business leaders are clearly recognizing the value of LinkedIn at work. Facebook showed the opposite trend. While 81% of ‘decision-makers’ also use Facebook, the greatest number of them (42%) used it for primarily personal purposes compared to 37% for both business and personal. Clearly, there’s still a case to be made for why high-level employees should be using Facebook to accomplish work goals. Although the stats are good news for LinkedIn, and arguably for Facebook as well, the data showed that decision-makers are still more inclined to use forums for business. 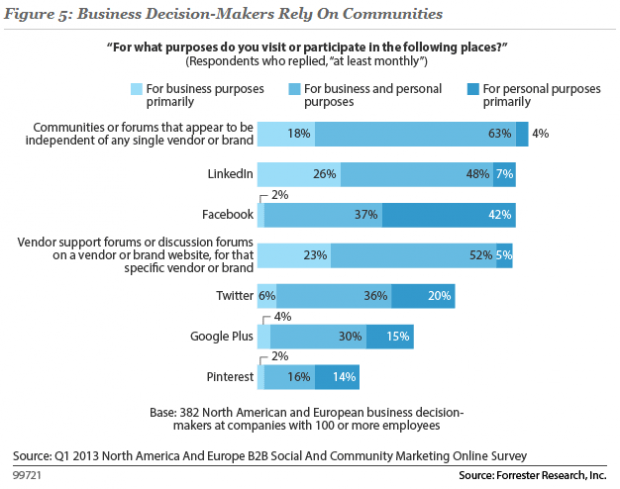 “Communities or forums that appear to be independent of any single vendor or brand,” beat out all social networks among those surveyed, with 85% of those surveyed visiting these forums, and a large majority of them for both personal and work purposes. Decision-makers still lean more towards forums than social networks for work purposes. Photo by Victor1558. Vendor support or discussion forums also proved to be widely used among decision-makers. While they fell slightly behind LinkedIn and Facebook (at 80% usage), more of the business people surveyed used these forums for work purposes than either of those social networks. And both types of forums were far more used than other leading social networks, including Twitter (62% usage), Google+ (49% usage), and Pinterest (32% usage). Obviously forums have business advantages that lead to them outperforming these social tools. While we don’t know what they are exactly, anonymity and the business-focused nature of forums may play a role. Overall Forrester’s data, collected using B2B Social Technographics, showed that 100% of the surveyed ‘decision-makers’ used social media for work purposes. This remarkable stat make it clear that the business benefits of social are starting to sink in. So which of these networks do you use most for business?